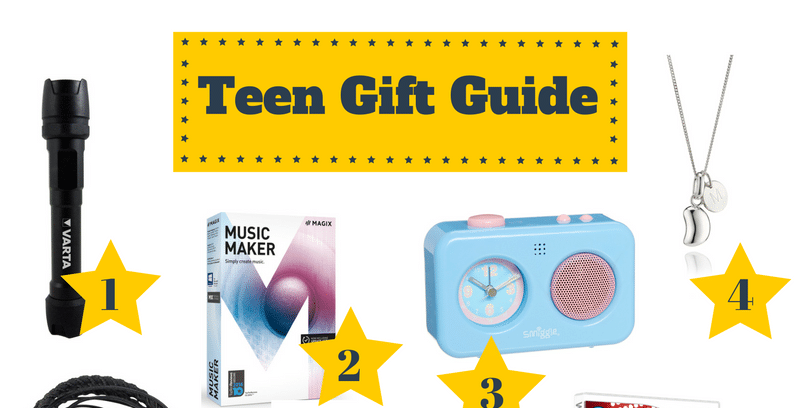 The most tricky age group to buy for…..teenagers! I find them quite hard to buy for, as they love things to be right, the right brand, to look cool and I can’t keep up with what is cool and what isn’t! So I put out a request to see what was out there, and to find some different ideas for teenagers. 1. *Varta 3W LED Indestructible Torch £25.99 – I saw this torch as a perfect Scouts torch, my son goes off each week with Scouts and they do a lot of nightime activities, but also when he goes away with Scouts he needs one for camp. Indestructible, and shock proof when dropped from 9m! Water resistant, and super high performance, his Scout leaders couldn’t believe how far the light went and all wanted to use Tylers torch! 2. *MAGIX Music Maker £26.99 – With MAGIX Music Maker software, making your own music has never been simpler. Produce your own songs easily on your PC using the mouse and keyboard. Feel good tracks will be pumping through your speakers in just a few simple clicks! My son has been using this and LOVES it, so easy to use and create some really fun music to accompany his YouTube videos. 3. *Smiggle Talking Alarm Clock £18 – How about waking yourself up? The Talking alarm clock will wake you up with your very own voice! Easy to use recording system records your voice message & plays it back when the alarm goes off! 4 colours to choose from. 4.Molly Brown Jewellery Jelly Bean Personalised Necklace from £55 – Molly Brown is a children’s jewellery designer. Most of their bracelets and necklaces come with multiple clasps, so they can be worn into adulthood. Each piece is presented in a gift box and gift bag. I picked out their iconic Signature Jelly Bean Necklace featuring an adorable Little Wish charm of your choice. 5. *Wraps Wristband Headphones £19.99 – How many times do you find headphones lying around, or lost. So when you’re not using them, why not wear them? Wraps headphones can be worn on the wrist, with a button microphone you can also answer calls, play or pause your music and skip tracks all without having to dig into your bag to reach your device. 6. *Get The Label Clothing – On-trend, Off-price. Stylish, a no brainer! The ultimate website for essential and indispensable designer clothing and footwear. I put together an outfit for £50, of all branded clothing and my son feels trendy now! 7. *The Voice Video Game £44.99 – The Voice UK™ will be hitting our screens on ITV in the New Year but you can enjoy The Voice experience this side of Christmas with the official The Voice video game, available on PlayStation®4, Xbox One and Wii (compatible Wii U) We have love the idea of playing this game, gets all the family involved and a great Christmas Day game! 8.Rose Gold Clock £35 – Rose gold is the ‘in’ colour, it is such a pretty colour. So how about a pretty rose gold alarm clock, with silent movement, so no moaning about the ticking! 9. *Gel Touch Gel Art Set £27.99 – GelTouch is an innovative, semi-permanent gel providing professional looking, salon quality nails at home. Teenage girls have plenty of time to make their nail look lovely, but don’t have the money to go the salon. So this Gel Touch set allows them use their own nail polish, but add a gel top coat using the polish provided and the LED lamp. 10.Dollie Jewellry £39 – Why not get some stunning jewellery, Dollie Jewellry is cute, collectible silver jewellery that you can layer. Made with silver beads and real gemstones, you can come up with your own style. Stacking, or stand alone, they look stunning together. My favorite is ‘Hope’ bracelet, with a angels wing charm. 11.FIFA 17 from £39.99 – The latest installment of the popular FIFA franchise this year includes a brand new feature, The Journey, powered by Frostbite, where you live your story on and off the pitch as 17 year old Alex Hunter. FIFA 17 transforms the way you play, compete, and emotionally connect with the game. I know many boys would love this game! 12.Star Wars Battle Quads £229 – These are an exciting new product coming to the market in line with the new Star Wars film. Each Star Wars Battle Quad is hand-painted and numbered, and comes in a wax-sealed gift box that lights up and plays Star Wars music specific to the film the vehicle in question appeared in. The size of an adult hand, each Battle Quad flies to 35mph in under three seconds and has on-board lasers which allow you to recreate your favorite Star Wars battles with your friends and record winning scores. 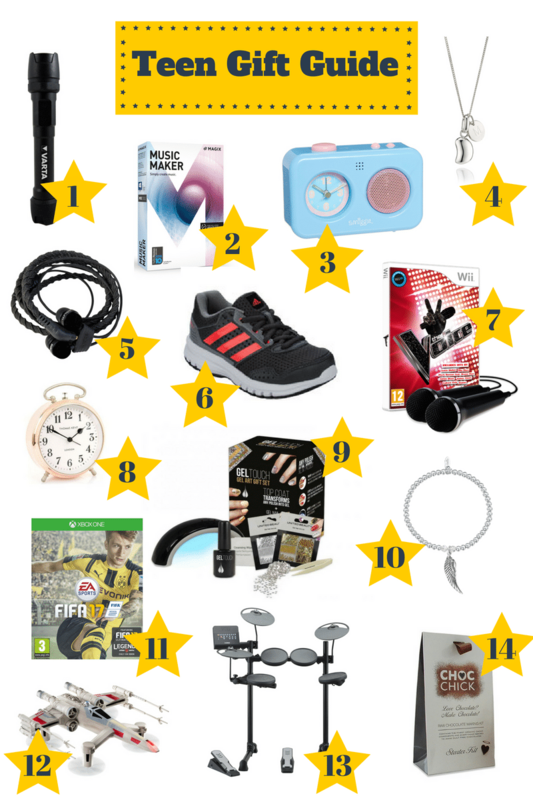 13.A Drum Kit with silent technology £442 – Give the gift of music!! It could be the start of a life long hobby or even a career. However, worried about the neighbors, or yourself having to listen to the practicing all the time?! Being compact and lightweight this kit can be set up in a small space (eg a bedroom) and – most importantly for others – can be played almost silently whilst using headphones – so practice can happen day or night without disturbing family or neighbours! 14. *CHOC Chick £12.99 – I don’t know many teenagers that would turn down chocolate, so how about getting them to make their own. CHOC Chick starter kit is an introduction to raw chocolate making, with enough ingredients to make around 30-40 raw chocolates (using the mini cases included) or 3 bars (using simple plastic containers) and over 30 truffles. 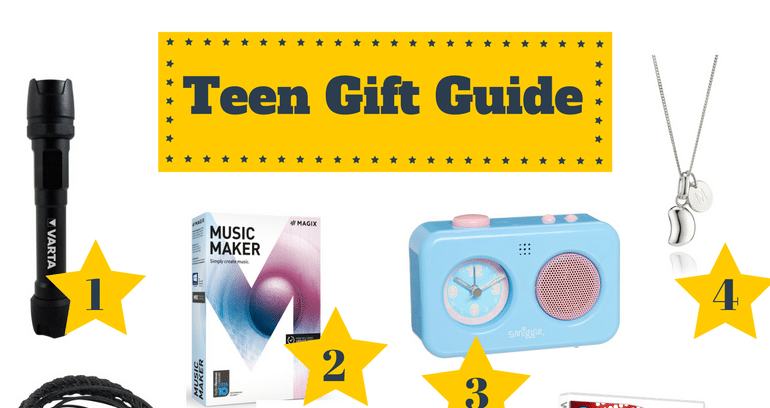 Luckily we don’t have any teens to buy for, but these look like great suggestions!